Well I posted on this thread because it referred to the software aspect. Will "Easel" be capable of complicated inlays? Or do you suggest an alternative? What's a good tolerance to use? It depends on what kind of fit you want and what kind of material. If you want it to be snug use a small one and if you want it to come out like a kids puzzle use a big one. I like tight tolerances for wood inlay and use 0.01 with a 1/32 bit. 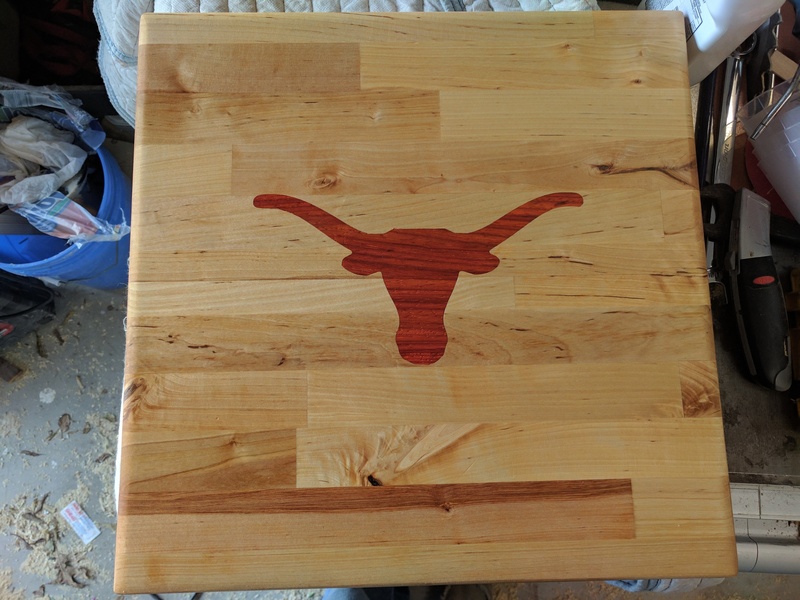 The results look great with walnut. I've been making lots of kids puzzles that are painted. I use a tolerance of 0.045" which gives clearance for paint and also leaves it loose enough that the puzzle isn't too difficult to play with. For this application I found the depth of the pocket plays a big role too, I've settled at 4mm so the inlay doesn't bind when being removed and placed in! I have yet to try inlay but I definitely will. I have made many inlays with templates and free hand, both are tough. I am still tweaking the machine and where its home is as my shop is too small. This looks great but I'm having trouble getting the inlay set up the way I think it should look/work. The design that I want to inlay is composed of 9 separate pieces. Can someone give me a hand? I understand that the sharp corners will be slightly rounded with my 1/16" bit. However, when I load this, the separate pieces are all combined into one piece to cut out and inlay. Am I doing something wrong? I have attached my SVG. 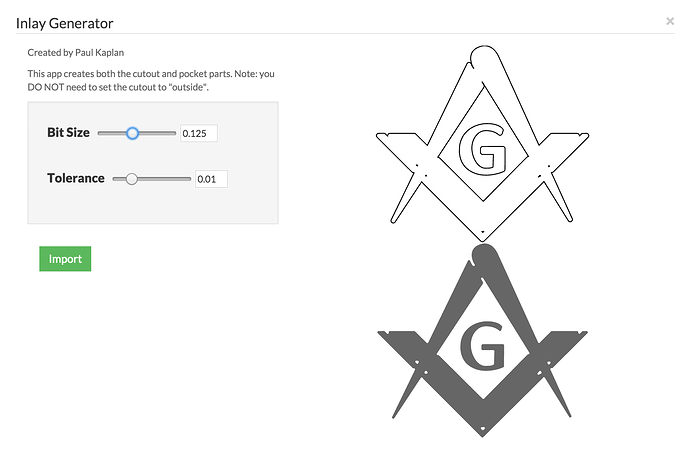 @TysonSwan I managed to get your design to work as individual pieces, but I suspect you'd have practical issues if you went to carve it out. My settings were 1/32" bit, with the artwork at about 12" square (the biggest a 500mm machine could do) and the tolerance set to .005" in the app. 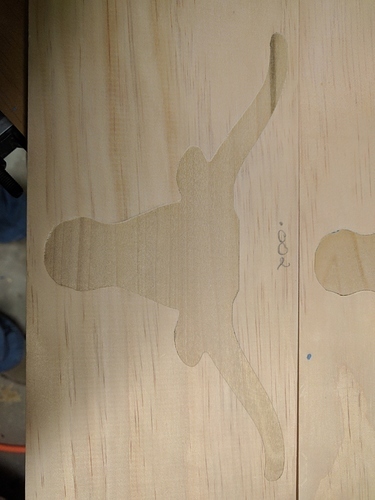 But here's the thing: All the areas where there isn't much white space, those areas that got filled in when you ran the inlay app, would not hold up well when being carved. The space between the calipers and the V, for instance. In real life that would be a little tiny "wall" of wood once it was carved out, and it wouldn't hold up well to any finishing work or the stress of having the inlay pressed into it, especially with only 5 thou of clearance. My suggestion would be to add some more white space. In the separation of the V, in the overlap between the calipers and the V, and in the overlap of the caliper arms themselves. Wherever you see those thin white lines, make them thicker. I really appreciate your help with this! I looked at using a 1/32" bit but the depth of cut was just over 0.1". I don't think this is deep enough. Here's the thing - I just carved this image (without the inlay app) at 4.250" x 3.869" with a 1/16" bit and it looks great. As you can see, the thin white spaces held up just fine. Carve the image with a fixed x to y ratio with x = 8". Load the same image but move all of the individual parts so there is sufficient spacing. Load the spread pieces into the inlay app. Only carve the inlay pieces. I'm not sure if this will work but I have plenty of scrap. The problem with doing that is that when you run the app, it generates a female pocket with the tolerances built-in for the male inlay. If you cut the female piece, then separate the pieces out to run the male inlay, it will not give you the same geometry and I don't know if it will fit. Hopefully, @paulkaplan can lend some insight. I'm not sure I understand the problem, so here is what I found while trying to make your design, let me know if this helps. The way the inlay generator works internally is that it makes repeated offsets to the design outwards and then inwards (and vice versa), which has the effect of rounding the edges which would be sharp and uncuttable. However because the parts are so close together, the offset of one section "bleeds" into the other, combining the shapes. I think it indicates that the male part simply wouldn't be able to be cut (the bit couldn't get inside the white spaces). The problem, as you showed, isn't with the female part (i.e. milling the black part) but with the male part (i.e. cutting around the black part). Another option would be to modify the design slightly. For example, using the "Offset" app to offset the design inwards slightly would be a way to add more whitespace as @Mike suggested. Yes, this is exactly the info. I am looking for. Thank you very much! What is the image size on your render with the 1/16" bit? I will report back with results. what outlines was used here? 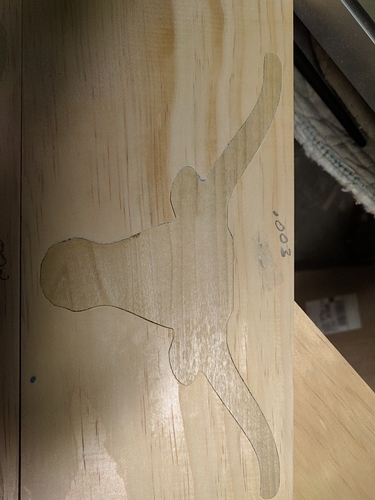 I finallly tested the inlay app in easel.. the first cut at .003 was a little loose.. .002 was pretty spot on.. Should i test it at .001? That's pretty awesome! I'm gonna have to give it a try. Here is the final.. I think I could have done .001 but might have had a snug fit.. I still have a few really tiny gaps, but not a huge issue.